As part of its annual Founder’s Day celebration, Saint Mary’s University of Minnesota (SMUMN) presented its Distinguished Lasallian Educator award to Alisa Macksey, LV 00-02, former director and associate director of Lasallian Volunteers. 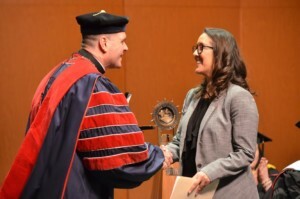 Macksey, who serves as executive director of SMUMN’s First Generation Initiative, received the award as part of the March 12 celebration on the university’s Winona campus, which also honored other outstanding faculty, staff and students, along with presenting Brother Superior General Robert Schieler, FSC, with an honorary degree. The Distinguished Lasallian Educator award, which is presented each year, recognizes a member of the faculty, staff or administration whose life of faith and service exemplifies the ideals of Saint John Baptist de La Salle. Macksey began serving SMUMN’s First Generation Initiative in 2015 and has been instrumental in developing the AXIS: Journal of Lasallian Higher Education and the International Symposium on Lasallian Research. Macksey, a graduate of Saint Mary’s College of California, served on the LV staff for eight years (2003-2011), four as associate director and four as director, before serving for four years (2011-2015) as director of programs at Christian Brothers Conference.